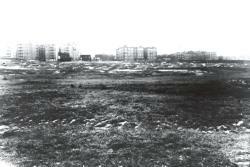 The black and white photograph was taken in 1940 from 126th Street looking south across former swamp land that would, within a year, become the site of the new Queens Borough Hall. 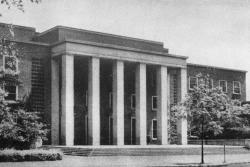 The color photograph shows that same view today with a mostly obstructed view of the rear of Borough Hall. Click on the images to enlarge. Enlarging the black and white image will identify the Kew Gardens landmarks in the background. 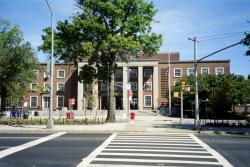 These photographs show the front of Queens Borough Hall shortly after it opened in 1941 and as it appeared, unchanged, in 2002. Click on images to enlarge. Thank you very much for the website. 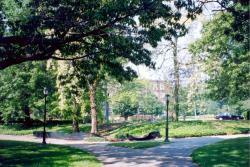 I was a nearly lifelong Kew Gardens resident (I am 29 years old) and I grew up in Colonial Hall. In fact I only moved out 2 months ago and my family still lives there. The building is still lovely inside. The lobby ceiling was restored somewhat to the original some years ago. There is a wall of mirrors on the left side and a wall of marble on the right as you enter. The apartments themselves are gorgeous but unfortunately many are being updated for the worse. My apartment was a converted studio - they ripped out the kitchen to make the bedroom, put the kitchen in the walk-in closet, took off all the decorative molding, and removed and replaced all the beautiful thick, heavy doors. As a result, I had conversations from my "bedroom" with people in my "kitchen" through my closed door. My aunt's apartment however is untouched as she moved in almost 25 years ago. The rooms are huge and the original molding adds an elegant touch. Next time I visit I shall try to take pictures for your website. The thing I loved best about my old building was the milk machine in the basement. My childhood friend's grandmother grew up in Colonial Hall and told us her mother used to send her down to get milk when she was a child. I will try to get a picture of it as well. On Saturday, September 16, 2006 a group of involved Kew Gardens parents will be hosting a first-time event, the KIDS FOR KIDS FLEA MARKET. This will not be your usual flea market though!. There will be selling tables, new and gently used merchandise and bargaining (of course) but the difference is that the children will be “in charge” of their tables and their parents will be “assisting” them. Each child will be selling toys, games, books and clothes and each child will also be making a donation to the NY Coalition for the Homeless-Bound for Success Project. Jennifer Giardina, a Kew Gardens parent, is spearheading this event because she wants her children to learn to “appreciate and value the things that they have and to realize and acknowledge that there are children who are less fortunate than they are.“ Jennifer is passionate about giving them empowering experiences so that they will “know that they can make a positive difference in the world and in their community.” This is a child centered event and she chose to fund raise for the NY Coalition for the Homeless-Bound for Success Project whose missions are to help children in shelters to learn and to play in a safe nurturing environment, to foster academic skills in after-school programs and to experience summer camp. The KIDS FOR KIDS FLEA MARKET committee hopes you will join them on Saturday, September 16th (rain date Sunday, September 17th) from 10:00 am–4:00 pm at the Cinemas Park located on Austin Street, off of Lefferts Boulevard (around the corner from the Kew Gardens Cinemas). For your family's enjoyment there will also be Facepainting, Arts & Crafts, Storytelling and Entertainment. If you would like your child (4-12 years old) to be a vendor at the KIDS FOR KIDS FLEA MARKET, there are currently spaces available. Please contact Jennifer at (917) 402-3271 for more information. Hi...my name is Bert Kaplan, and I appear in the graduating class of PS99 for Jan. 1946. I was quite pleasantly surprised to come across your website and want to congratulate you for it. 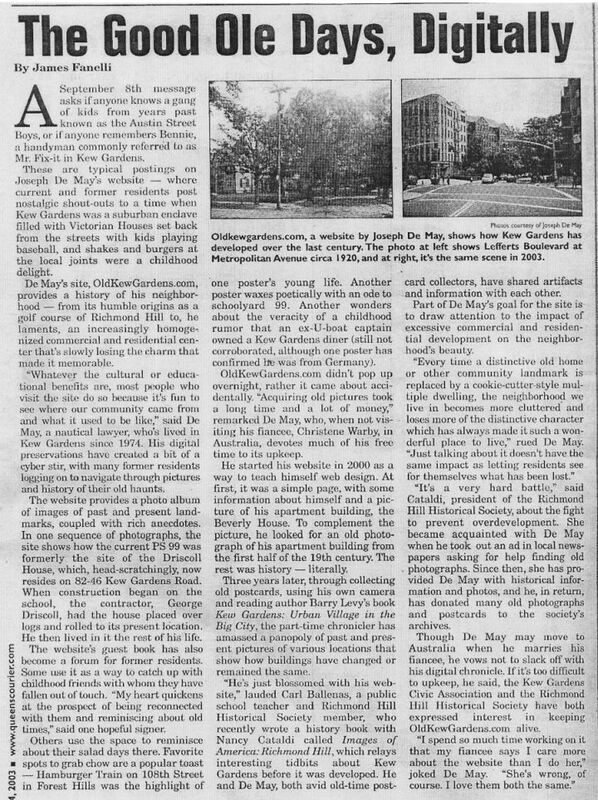 I was raised in Kew Gardens from 1931 to 1952, when I moved to Flushing. Your website provoked intense nostalgia and many memories of my years there. I lived above the stores on the Northeast corner of Lefferts and Metropolitan. It's the corner with the "big" sidewalk where we used to play stickball, baseball (with a tennis ball), boxball, baseball against the stoop, hopscotch, etc. The years there were great, but it was during the great depression and WWII, and most of us in that area of Kew Gardens were of modest and/or limited means. My family operated the Kew Forest Hand Laundry. At the time, there was a pharmacy on the corner (now I believe it is or was a bank in the recent past). Just north of the pharmacy, run by "Doc" Bayer , was Schulman's Dry Cleaning Store, and then our Laundry. I lived directly above the laundry in the aprtments that, I believe, are no longer in use. I don't have the time right now, but I will look for old pix and see if there are some I can contribute. I know I can help a bit more with the graduation class pix because some of the names are slightly incorrect and one or two are actually missing. I'll try to straighten that out in the near future. In the meantime, I note there is a paucity of info about life in Kew Gardens during the 1930-1950 years and will do my best to try to fill that in as best I can. I also have many memories of life in PS99, which was actually an excellent K-8 school, with mostly excellent teachers who worked hard and demonstrated their dedication day after day. There were actually two male teachers in that school; one taught shop to the boys, and the other physical education in addition to his regular class. But I'll go into that more in the near future. By the way, we used to walk to PS99 from Lefferts and Metropolitan regularly since there was no transportation to the school, in the morning, at lunchtime, and at 3:00pm, so all the images you have of Lefferts Blvd are places that we passed on a daily basis. Right now, I'm mostly interested in touching base. My wife, Teddi, and I are retired and live in Boynton Beach, Fl., having moved here in 1993. Incidentally, I did send an email to Lisa Steiner, who contributed the graduation picture, but haven't heard from her yet. I have no contact with any of the others, but I'm hoping that will change as I'm able to contribute to the website. Once again, thank you for the website...and the opportunity to be nostalgic in a constructive way. Our plans for the reunion on September 15 & 16th are coming together well. Carol Drescher Koenig and her committee have completed the arrangements for what promises to be a tasty buffet dinner on Saturday night at the New Hyde Park Inn located at 214 Jericho Turnpike (Jamaica Avenue becomes Jericho Turnpike), New Hyde Park, NY 11040. We have reserved the room from 5 p.m. until 10 p.m., so come early and stay to the end. We have the events of fifty years to hear about and addresses to exchange! There will be an open bar for four hours. For out-of-town guests, hotel accommodations are available at the nearby Floral Park Motor Lodge. Reduced rates were quoted to Carol for our reunion guests at $98 for a single (queen) or $121 for 2 double beds. Check out their web site at www.floralparkmotorlodge.com. At 3:30 p.m. on Friday, there will be an opportunity to tour the Richmond Hill High School building and meet with an administrator. The school has changed, e.g. 6% Caucasian, 14% African-American, 47% Hispanic, and 34% Asian/enrollment 3694 or 139.9% overcrowded/7 year graduation rate 67.3%) but the administration has great esprit de corps and 2 year faculty retention is 68.5% compared to 59% city-wide teacher retention. R.H.H.S. is still considered a good high school, even though we have been gone for 50 years. Also, on Friday, at 7:30 p.m., there will be a sit-down dinner and informal gathering in a private room at Trinity Restaurant (190 Jericho Turnpike, Floral Park, NY, tel. 516-358-5584) located just 0.1 mile from the Floral Park Motor Lodge. It is my belief that after being apart for a half century, some us have the need to spend more time together hearing the exploits of returning former classmates than will be provided during the five hours of the buffet dinner on the following evening. I encourage all local and out-of-town returnees to attend. For planning purposes, would you fire off a quick email to both Carol and me telling us IF YOU CAN ATTEND the Friday night gathering and/or the high school tour (Fred.Meyer@valpo.edu)? The cost of the dinner is about $25/person (tip included) and the cost may be partially or completely underwritten when we have the final count. A sample menu can be seen at trinityrestaurant.com and on their web page hit “catering” under the Trinity banner, and then hit “catering buffet menu”. I believe the orange-colored room shown on the restaurant’s website is the room we have reserved. If you have not yet sent your check ($100/person, made out to “Carol Koenig”) to Carol Drescher Koenig at 8 Gainsboro Lane, Syosset, NY 11791, we would appreciate it very soon. Carol’s telephone number is 516-921-6990 and mine is 219-462-8912 if you have questions about the reunion activities. Of course, spouses and significant others are most welcome. If you are planning to attend, please send a brief biography to Carol telling of your post secondary years. Please also assemble and remember to bring along photographs, memorabilia, newspaper clippings, etc. for display on Saturday evening. Be sure to identify anything you bring along to insure safe return to the proper owner. Well, after some effort and much expectation, the Richmond Hill High School’s class of 1956 FIFTIETH REUNION is less than a month away. I, Carol, and, Carol’s tireless committee cannot wait to welcome you on September 15 & 16th. Ya’all come, and it is not too late to inform your friends who may be 1956 graduates who we have not made contact with yet, and who might want to attend. They just might need a nudge from you, and this is truly a case of the more the merrier! P.S. People are writing to us almost daily to inform us that they plan to attend, so the list may be slightly incomplete, but this is the current list of attendees who will be at the class reunion. Please do your utmost to contact former classmates and alert them to our plans even at this late hour!!! The next music and poetry show will be held at the Theater Cafe at 106-03 Metropolitan Ave in Forest Hills. The date is Thursday, August 24th, beginning at 7 P.M. Promises to be a terrific show. My name is Ron Kooper. I was born at Kew Gardens General Hospital on Friday, February 20th 1953 at 10:30a.m. We lived in Woodside and and then moved to Main St Flushing about 15 mins from Flushing Meadow Park. After that we moved to Bayside Queens where in 1968 we moved to Rochester, New York. Attached is a photo of a dance at the Queens School. The photo would have been taken by 1964. Editor's Note: Click on the link below to read a letter to the editor of the Los Angeles Times written by OKG contributor, Al Linsky. Al's letter is about one of Kew Gardens' most prominent residents - Ralph Bunche. Click here to read the letter (at the bottom of the page). I ran across the link to oldkewgardens.com completely by chance and much to my delight! Since then I have spent as much time as possible on it both learning and reminiscing. I thank you from the bottom of my heart for taking the time and effort to create a space that has obviously touched so many people spanning a number of generations. My family moved to Quentin St. (now 80th Rd.) back in the mid-1930's having emigrated from pre-war Germany. My mother, nine years old at the time, attended and graduated P.S. 99 where she was ironically nicknamed Frenchie" because of her accent (now long gone). She further went on to graduate Michigan State University and to have an excellent career in New York's fashion industry, at a time when that was a real feat for a woman. In fact, I'm proud to say she's still actively working to this day+that's a New Yorker for you! I came along in 1958 and while my first conscious years were spent living at the Seaway Hotel at Idyllwild Airport where my father was general manager, we then moved into The Park Vendome on 123-60 83rd Ave., closer to my grandmother. Our apartment had the cheerful views of the Courthouse and Detention Center from the living room and Maple Grove Cemetery from the bedrooms! One particular memory I have is of the demonstrations outside the courthouse when members of the Black Panther Party were being held in the Detention Center. I attended P.S. 99 for a couple of years but did not graduate, and was, therefore, very surprised to find myself in the posted photo of class 1-3 of 1965 (I am sitting in the second row, far right). Unfortunately, I can't help you by remembering any of the names of my classmates in the photograph. The friends I do fondly remember from school are Peter Leffgaretes (sorry about the spelling), Mitchell Zerring, Charles Wheeler, Richie Klauber, Candy, Richard (musician), Eric and Sharon. There, naturally, were many others but my foggy memory won't let me recall their names at the moment. It was at P.S. 99 that my passion for art developed. Peter and I spent hours blissfully drawing away, had our pictures displayed in The Children's Museum of New York at the behest of visiting representatives of The Board of Education, and won a scholarship to art classes on Saturday mornings. Miss all the times in old schoolyard and the great wall where I developed a passion for handball. Funny, everyone seems to talk about the schoolyard, but I haven't noticed any mention of the dirty lot next to it which I see in the pictures is now a large high-rise. That dirty lot holds tons of fun, adventurous and some frightening memories for me with its craggy, wasteland of a terrain. Although I moved away from Kew Gardens in 1979 or 1980, to this day I crave for Dani's pizza, it was the best! I was very sad to learn that Dani passed away in 2003, but am proud to have known him. He was truly a kind, unforgettable man who built a Kew Gardens' institution and the number of letters that make mention of him is testament to the staggering amount of lives he touched and will always be a part of. It was wonderful to read a letter from of the contributors who returned to Dani's after being away for years and how happy he was that Dani remembered him. I had this same experience! And let's not forget Andre! I was thrilled to see a picture of him taken in 2004, still behind the counter after 44 years of making great pizzas. Mr. B's, The Homestead, sledding at the Toilet Bowl, doing my best to avoid Randy Richards, the Crossroad Drug Store's lunch counter, Forest Park, Jahn's Ice Cream Parlor, wanderings through Maple Grove Cemetery, George and Jeff Landle, George Bubaris and family, Howard and Ruth Eisen, real cherry cokes, the scary underpass at Union Turnpike, The Salty Dog, Alberto's Restaurant, Dr. Ross the optician, Mrs. Yaro and her sons, Frankie the Good Humor man, etc.+fabulous memories! Thank you for awakening them! It would be wonderful to hear from any of my old friends so please post my address and I'll be looking forward to seeing if any familiar names show up in the guestbook! Editor's Note: As of February 1, 2005, Old Kew Gardens [.com] got a new email address with Gmail, which is the Google web based email service. You've probably heard that Gmail offers two gigabytes [2,000 MB] of free storage. It's free, but available by invitation only. I have invitations I can distribute to friends. I'm not selling them, I'm giving them away. They are available on a first come first serve basis. Just send me an email telling me you'd like one. Some Guestbook signers choose not to publish their email addresses. If you wish to contact one of them, send me an email identifying the guestbook signer you wish to contact and giving me the date his or her message was posted. Your email to me must contain your full name, and August also include anything else you wish to tell the signer. I will forward your email to the Guestbook signer you wish to contact, but with no cc or bcc to you. It will be the signer's decision whether or not to make contact with you. Any emails which contain spam, adult content, or appear suspect for any other reason will not be forwarded. ~The Editor.